A dating website donated to the search, and even gave him a profile that says he is "looking for my Juliet". "We don't want him to lose hope," Arturo Munoz, a conservation scientist, told AFP news agency. "We continue to remain hopeful that others are out there so we can establish a conservation breeding programme to save this species," he said. 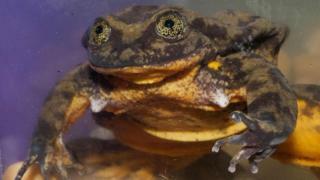 But conservationists will have to be quick, as Sehuencas water frogs don't often live beyond 15. As part of a campaign to raise $15,000 (£10,800) before Valentine's Day, the dating website Match created a profile for Romeo complete with a picture and essential information. "Not to start this off super heavy or anything, but I'm literally the last of my species," the profile reads. "I tend to keep to myself and have the best nights just chilling at home, maybe binge-watching the waters around me." It adds: "I just need another Sehuencas like myself. Otherwise, my entire existence as we know it is over (no big deal)."